Do Guinea Pigs Like To Be Handled? When getting a guinea pig for the first time, it is hard to know what to do with them as there is no experience of dealing with them until now. When we got our first guinea pig he was a very jumpy piggie and dashed around his cage, so much so you could barely catch him. But as we got to know more about guinea pigs we realised how much value there was in regularly holding them. Un beknown to us they really love to be held. Holding a guinea pig is the way you get to know them and the way they get to know you. You can find out about what they are like, how they respond to you, what there character traits are. It will also give you chance to understand about their bodies and keep an eye on them for any defects. 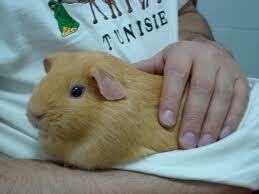 By holding your guinea pig often you also gain its trust. It will get to know you and who you are. It will find out about you. They are natural prey animals which means that they are very jumpy animals. They naturally run away from any beings that dare to cross its path. So by spending time with it giving it physical touch you build trust with it. You teach them that you are not scary and should be someone that they can trust because you wont bring them harm and actually can give them a lot of love and affection. They really do value being handled well. This is why anyone who owns guinea pigs should pig them up gently and handle them with care. They will welcome this and respond in kind with a hearty purr. If you keep you guinea pig outside or in an outhouse, then this becomes more necessary as it’s easy to only see them when you feed them. But try and set aside time to see them and handle them. Handling time can be just as important as feeding time. When they are housed inside, you become more aware of them and they become more part of the family. This is one of the reasons why its better to keep them inside than out. Your family will also be more aware of them and handle them more as well. The more you handle them, the more they will respond to you so try and do it often. It will be worth it!